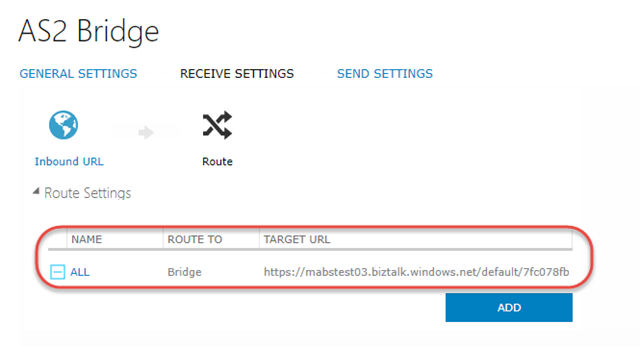 In my previous post about using the new EDI bridges in Microsoft Azure BizTalk Services (MABS), I promised to follow up with an example of using the AS2 bridge type – so here it is. Applicability Statement 2 (AS2) is all about establishing security and reliability when transmitting B2B messages over HTTP/S. It provides for digital signing and encryption as well as acknowledgements via Message Disposition Notifications (MDN), which also leads to support for Non-Repudiation (NRR). Like BizTalk Server, MABS provides support for AS2 with EDI transactions; in fact, the latest update has enhanced this experience with additional symmetric key encryptions including AES, DES3 and RC2 as well as MD5, SHA1 and SHA2 for MIC calculation. The main difference in this latest update, though, is that the AS2 bridge and the associated agreement are configured separately, just like the EDI bridges themselves now are. Understanding the sequencing of these bridges and how they connect is key, however, and may not be readily apparent from the current documentation – hence the reason for this article. 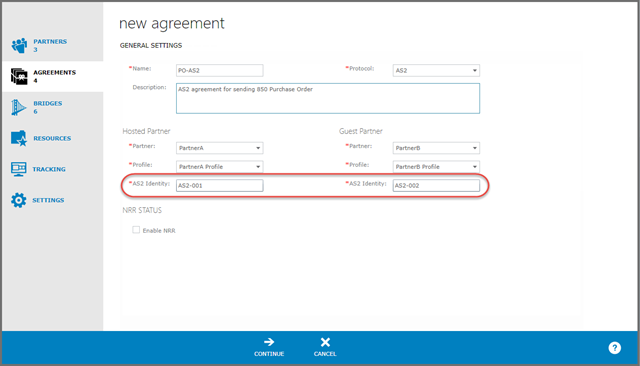 1 Partner A (host partner) sends a Purchase Order (EDI 850) to the EDI Send Bridge where the “Send” settings of the EDI agreement are hosted. 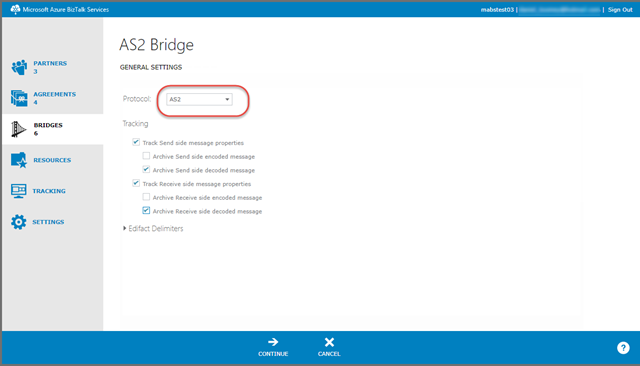 2 After performing any configured transforms, promotions & lookups (none req’d in this demo), the bridge routes the message to the AS2 Send Bridge, where the AS2 agreement is hosted. 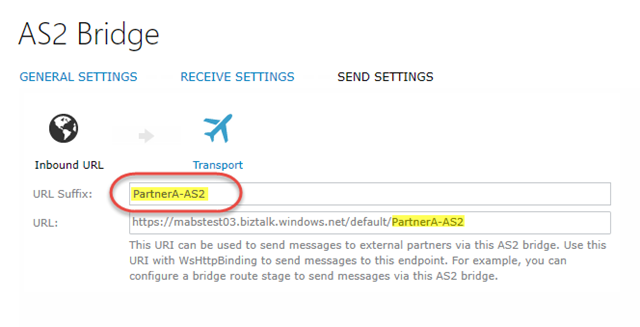 3 The AS2 Send Bridge performs any signing and/or encryption specified in the AS2 agreement “Send” settings and routes the message to the HTTPS endpoint for Partner B‘s service. 4 Partner B eventually sends back a Functional Acknowledgement (EDI 997) message to the published HTTPS endpoint of the AS2 Receive Bridge, where the “Receive” settings of the AS2 agreement are hosted. 5 After performing any decryption specified in the AS2 agreement, the AS2 Receive bridge routes the message to the EDI Receive Bridge. 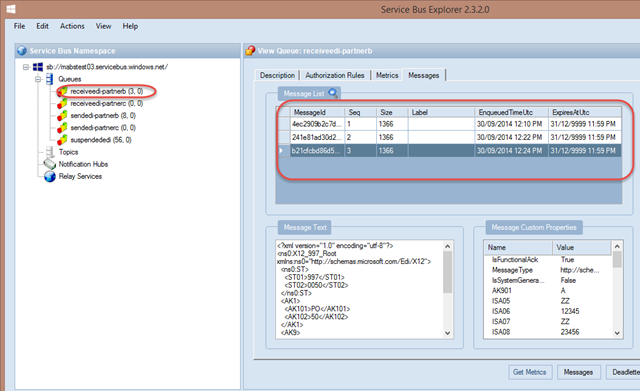 6 The EDI Receive Bridge performs any configured transforms, promotions & lookups (none req’d in this demo) and routes the 997 message back to Partner A‘s configured system for receiving acknowledgements (which in this case is simply a Service Bus queue). Notice that the AS2 bridges are placed at the point of contact with the guest partner (Partner B), both for the send of the Purchase Order (850) and the receive of the Functional Acknowledgement (997). Let’s walk through the process of implementing this scenario (assumes you have completed the steps outlined in the previous post). I’ve chosen to archive the decoded message here. This option is only available in certain editions of BizTalk Services, including Developer. Because we’re using the X12 protocol here, there’s no need to bother with the optional EDIFACT delimiter settings. 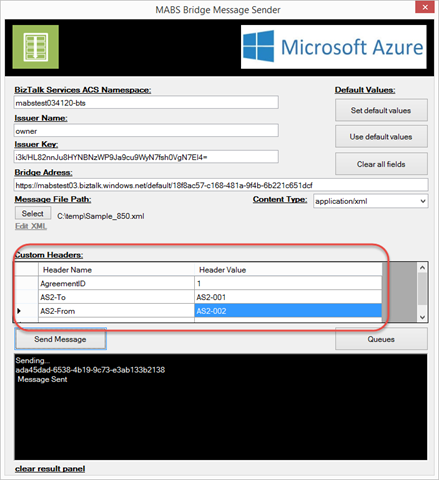 This page also allows us to enable Non-Repudiation on Receipt (NRR) – which can be used to prove the authenticity and validity of a message if partners agree to employ this feature. Obviously we don’t need this within our demo here. For more details about how to configure these pages, please refer to the MSDN documentation. Once we save the agreement, it appears in the portal listing under the AS2 agreements page (see the screenshot at the beginning of this section). Manufactures a 997 message with the appropriate control numbers, etc. by parsing information out of the request. Great tutorial.. really help me get started to understand how things works..
in that document it says it requires “AS2-MessageID” in the header when you sending request to AS2-receive endpoint. After few frustration moment (and few lemonade cans) I found your blog and it says the header should be “Message-ID” instead of “AS2-MessageID”.